Egypt’s interior minister, Mohamed Ibrahim, said Saturday he is ready to leave his position if that is what the people want. He added during a press conference held at the interior ministry that he had accepted the ministerial position at a critical time. Ibrahim’s statement follows uproar over an assault captured on camera by security forces on a 48-year-old man who was stripped naked and beaten in front the presidential palace Friday. Ibrahim, who was appointed as interior minister last month, said that he opened a probe into the incident and that it will be transferred to the public prosecution to hold those responsible to account. 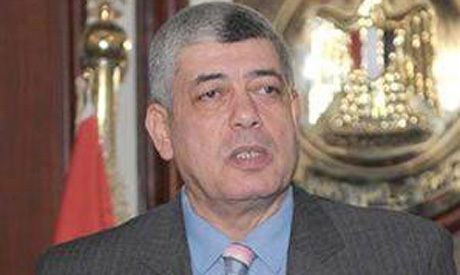 The interior ministry is a purely patriotic entity, Ibrahim said, working only for the security of Egyptians, and that if the ministry collapsed, the country would become an open field for militants. Over the past week, tens of thousands of protesters have swept nationwide squares to express contempt for the rule of Egyptian President Mohamed Morsi. Three cities in the vicinity of Egypt's Suez Canal are currently subject to a month-long state of emergency and daily curfew declared by President Mohamed Morsi Sunday following three days of deadly unrest. Morsi later allowed governors of the three cities to ease curfew restrictions in their respective cities in accordance with the local security situation. Ismailia and Suez have both witnessed anti-government protests and sporadic clashes since the second anniversary of Egypt's January 25 Revolution on Friday. In Suez, nine people — including one police conscript — were killed, while at least one civilian was killed in Ismailia. Last Saturday, adding fuel to fire, a criminal court sentenced 21 Port Said residents to death for their involvement in February 2012's Port Said football stadium disaster. The harsh verdicts prompted riots and clashes in the already tense city. Some 37 were reported killed. This entire case is turning into a debacle....someone should truthfully explain to the Egyptians or resign! The Interior minister earlier apologized and promised an investigation, this was acceptable. What has transpired since is most certainly not... the victim has now appeared on Egyptian State TV stating that in fact, he was robbed and beaten by the protesters, and not the police, followed by his daughter stating on another channel that her father was threatened into changing his story! So now Egyptians can not believe anything they see, even with their own eyes! It remains to be seen who is responsible for manipulating the justice system.